After living in our new home for just under a year, my wife and I finally have a dresser. It has been a big adjustment to all the new storage space. The year without a dresser went by very quickly and it forced me to take stock of my clothes time and time again. I purged unnecessary clothes from my wardrobe on numerous occasions last year because I didn’t have room for extra clothes. The first purge was our yard sale in preparation of our move. Then, I made a donation to the Vietnam Veterans. With just these two clothing purges, I easily cut my wardrobe by half. Living without a dresser in our bedroom was a bit of a pain at times, but it did get my wife and I to live with less clothing clutter in our lives. Now, we’ll need to be mindful and remember not to let the clutter creep in just because we have more storage space than we used to. My daughter is going to be three years old in less than a month. The amount of clothing and other baby products that we have gone through in those 36 months is pretty extensive. We have donated a lot of items to local charities, consignment shops, and friends, but it seems like we still find ourselves behind the curve in the accumulation battle. SwapBabyGoods.com is the first web site of its kind, providing a friendly place for parents to swap, buy or sell baby items that are no longer needed. Our philosophy is very simple – Why buy when you can swap? Our product focus is baby items; for this reason, our users can enjoy the website, knowing that they are part of a community. Our primary goal is to provide a platform that brings together willing sellers, buyers and swappers in an online marketplace, benefiting everyone involved. Babies grow so fast and so do their needs. Before we know it, the cute little outfits, baby toys, and other baby items we once could not live without become outgrown and underused, taking up an inordinate amount of space in our homes. The baby item one family is ready to put in the attic or out in the garage sale might be just what another mom or dad is looking for. Our ultimate goal is to help parents all across the nation save money and the environment by providing them an online venue to swap baby items. While there are many options to buy, sell, or donate items, this looks like a pretty good resource for tracking down some must-have baby products. It also looks like a place to get rid of clutter that your little one no longer wants or needs. Do you know of other baby goods swapping websites? Let us know about those resources in the comments. Lifehacker’s Adam Pash tipped us off to an invaluable resource to use when cleaning out your refrigerator and kitchen pantry: StillTasty. StillTasty’s tag line is “Your Ultimate Shelf Life Guide – Save Money, Eat Better, Help The Environment.” You can search for a specific food item, or you can browse through the categories to determine how long it is safe to keep a product. The site is easy to navigate and will keep you from wondering if the unopened bottle of ketchup is safe to consume. There is also a question and answer section. My favorite question so far is “I Left Pizza Out Overnight — Is It Still Safe To Eat?” The answer: No. The next time you clean out your refrigerator and pantry, keep StillTasty open to help you determine what can stay and what can go. The Pickle Picker is just what any pickle lover would want. Trent Hamm, author of the blog The Simple Dollar, presents an inspiring column on financial uncluttering as part of our month of sharing. San Francisco’s Department of Aging and Adult Services and the nonprofit Mental Health Association of San Francisco have created the Institute on Hoarding and Cluttering. TheHappy1 shows off her office, which can fit into any living space. Can someone be a collector and be uncluttered? An uncluttered collector, by definition, takes pride in his or her collection and displays it fully and respectfully. Unclutterer writes a post on mindful consumption on The Simple Dollar and also launches a new e-mail subscription feed. Pull out the clutter from under your furniture and find it a permanent home that shows that you honor and respect your belongings. This may be the heart of my issue with e-mail. It’s the fundamental flaw as a medium that keeps me from wanting to use it. I know that for most interactions there are faster and more effective ways to communicate. I’m not convinced the phone or face-to-face are the only solutions, but I think that they are definitely more efficient than some e-mail messages I’ve crafted. I really like communicating over twitter because it forces brevity. It’s difficult for others to misconstrue “I am running late because my child had to be rushed to the hospital.” It’s plain speech in 140 characters and can be accessed when it’s convenient for the user. I also do most of my communication with the Unclutterer staff over Campfire. It’s a chat room structure that facilitates on-going communication. Since the conversation is continuous, problems rarely arise among members of our team because clarifications can be made throughout the day and people add to the conversation as their schedules permit. What communication systems do you prefer over e-mail? Do you think the seven percent figure named in the article is accurate based on your experiences? How would you change e-mail if you could? [The desk is from] Ikea!! 😉 I purchased kitchen cabinets and countertops and made it so it fits the length of the room. 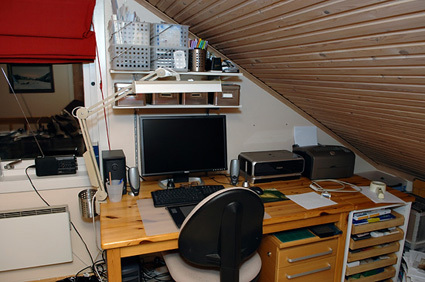 I have another 186 cm to the left of the window (that’s my husband’s desk), that makes the desk 5 meters long in total … Behind me I have more cabinets where some other printers are stored on top. I really like how the the desktop is separated into distinct work spaces. I also like how moving the storage from the wall into a cabinet provided space for inspiring artwork. 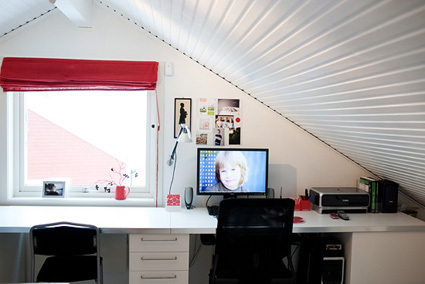 Thank you, MeAndMyPictures, for a before and after look into your office. Simple, recycled, and space saving — a trifecta of uncluttering! Thanks to reader Adora for the initial link. I love products that promise to exercise your body without any of the hard work. Just sit or stand while the “exercise” machine does all the work. The Hawaii Chair brings this concept to new heights by simulating a hula dance while you sit back and go about your daily routine at home or the office. Hawaii Chair combines the ancient art of the Hula of the Hawaiians with an easy-to-use fun exercise machine. The Hawaii Chair is an automatic exercise machine; you don’t have to exercise, the Hawaii Chair will do it all for you! The Hawaii Chair’s exercises strongly affect your waist, buttocks and thighs to thaw and loosen redundant fat. After using the Hawaii Chair you will have a narrow and well-defined waist. Old men can use the Hawaii Chair easily to help improve the operation of digestive and cardiovascular systems. I’m sold. This thing is a steal at $300. No strenuous activity while getting fit and shapely? I’m going to have to take their word for it. I can’t wait to sit in a meeting across from someone in a Hula Chair! Lee’s cookbooks are perfect tools for modern, busy families. For those of you who have spring fever and are itching to get outside and clean up your yard, here is a nice 30 gallon gardening container that may interest you. Since readers were so outraged by our Sandra Lee suggestion, here are other fast and easy cookbooks for busy people. As paper becomes less and less important in the digital age, the paper boarding pass may also be a thing of the past. Is disorganization inherited genetically? Phooey! Sally and Paul will never quite see eye-to-eye about housework, but if they can learn to respect each other’s perspective, their marriage — and their house — will keep running smoothly for years to come. I agree that talking to a professional who can see the issues from a caring and outside perspective can do wonders for partners who are struggling with clutter issues in the home. Check out our previous articles for even more advice. And be sure to give the whole of the Redbook article a read! Photo by Greg Ruffing for Redbook. 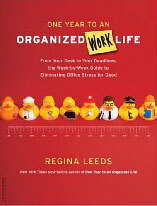 As an semi-organized person, I wasn’t sure if Regina Leeds’ book, One Year to an Organized Work Life, would apply to me. I was pleasantly surprised to learn that even the most organized person has something to learn from Leeds. Leeds breaks her book down into manageable chunks by months. Each month has a “work habit of the month” and a “daily home habit of the month” (e.g., January: Start Fresh). I’ll admit that the pre-determined monthly habits stifle her Zen mantra that runs throughout the book. Having a choice in the monthly habit would make it more personal, individualized and productive in the event the habit is already in place. But, if you don’t yet have all of the habits, it could work for you. In order to reap the benefits of Zen organizing, Leeds says that journaling is essential. She uses prompting questions to get the thought process started. In addition, there are lots of examples to help with writer’s block and encourage thoughtfulness. By March, much of the physical work environment has been organized, and the remainder of the book covers new habits. There is little reflection upon maintenance of the newly organized space. There is a monthly summary to reinforce the new habit, but there is no reflecting on prior months. Leeds expands upon the benefits of meditation, exercise, and diet, as well as a greater psychological awareness that will contribute to increasing one’s self confidence and positivity. This book may not be for everyone, especially if you are strictly interested in workplace organization. The personal journaling required to reach organization goals is a part of all 52 weeks. Also, her Zen connections strongly connect home and work, thus you’re just not overhauling your office, but your home and personal life as well. She may lose readers in the introduction with her ideas on diet, exercise, dream board, work life journal, etc. 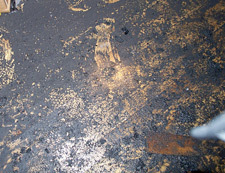 Leeds believes that all of these factors directly impact work organization. Overall, Leeds’ book One Year to an Organized Work Life is a practical resource for those in need of a complete organizational overhaul and for others who could use improvement in a few problematic areas.